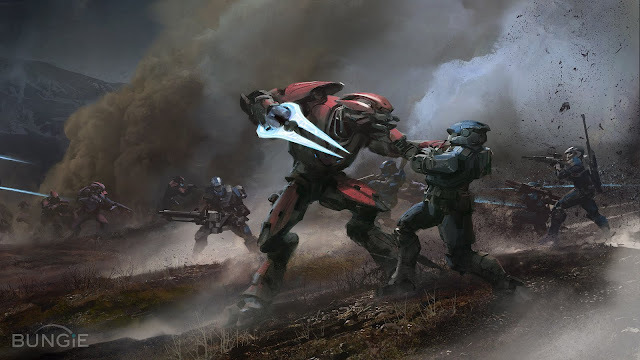 So what’s in the detail of the new Halo: Reach Multiplayer trailer? Here’s some paraphrasing from the HBO forum. There’s jetpacks! Active camouflage, and sprint abilities. Your radar appears to indicate the name of the area you're in. Covenant grenade launcher weapon of some kind as a foil to the Human grenade launcher. Also there is some some kind of Covenant equivalent weapon of the Spartan Laser. "Revenge" come up as a player headshots the enemy - a new medal if you get back someone who got you first? There was also a tank. As we know, tanks beat everything so I call dibs on them! MP looks sweet! I am definitely more excited for campaign, but damn. This just looks so chaotic and fun. And Bungie is not done with the surprises yet, I'm sure.